We’d been congratulating ourselves all summer on the absence of rodent roommates in our Montana residence when, on their first night here, our visiting friends spotted a mouse. Out came the mouse traps, baited with peanut butter. Out came the baby gates, keeping the dogs away from the traps. A couple of mornings later, forgetting that there were still traps out, I let Jana come downstairs with me. Zeroing in on the scent of peanut butter, Jana beelined for its source. SNAP! Jana’s head jerked back, then her nose immediately moved forward again, seeking and finding the now disarmed peanut butter. Once she’d licked the snapped trap clean, she hunted for others. A week later, she was still checking that area of the office for traps, uh, peanut butter, every morning. If a dog’s motivation to go after something is strong enough, a moment of shock or pain will not deter her. The thorough training that is supposed to — but rarely does — accompany the installation of invisible fencing should, it is claimed, teach the dog to avoid the “fence” so as to avoid receiving an electric shock. The dog is fitted with a collar that normally gives a warning beep if the dog approaches the underground wire that makes up the “fence.” The collar is supposed to deliver a shock only if the dog ignores the warning. Leaving aside the issues of malfunctioning fences and collars, this system rarely works as perfectly as the salespeople describe. For some dogs, the experience of the shock, felt during “training” is enough to deter the dog from ever again approaching the perimeter of the yard. (For some dogs its enough to deter them from going outside at all, and it can have even worse effects, too, but that’s another blog.) But dogs who are that easily deterred are rational enough to be taught to stay in the yard without shocking them. For many other dogs, the shock wouldn’t work. 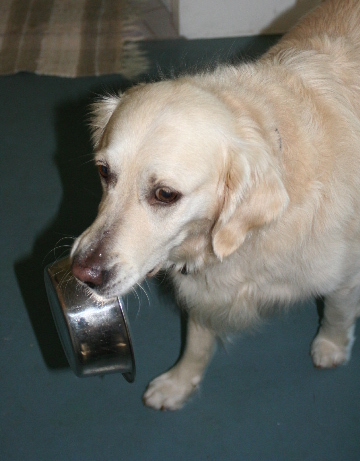 For instance, take a dog like Jana, who is highly motivated by food. A moment of pain isn’t much of a deterrence. She’d cross an invisible fence in a heartbeat if someone on the other side proffered a spoonful of peanut butter. A more likely scenario arises with dogs like Wylie, dogs who love to run and chase things. These dogs would be unlikely to consider — or even notice — the shock as they flew across the yard and over the boundary, in hot pursuit of a running cat, deer, or other fleeing animal. This dog might, however, think twice about coming back into the yard on his return home after the chase. Winded, walking more slowly, he’d approach the “fence,” hear the warning beep, and, quite likely, decide that going home wasn’t worth the pain. So. An invisible fence doesn’t keep your dog safe and won’t contain the sort of dog who most needs strong boundaries. The only thing that can do that is a lot of (humane) training and a watchful human on the premises. If you’re wondering what happened to the mouse, he (she?) was electrocuted while chewing through the wires to a bathroom light fixture, shorting out the light in the process. No rodent friends or relatives have been spotted, and the light has been replaced. Pam, I have only recently been introduced to your blog. I think you are spot-on with your assessment of invisible fences. You have many trainers who support you in your assessment of these containment systems, so don’t worry about folks who oppose you. As a trainer who recently moved from TN, I had the sad job of explaining to owners of dogs who were missing after installing an i.f. that it was quite possible several things could have happened: coyotes found the meal they were searching for; the dog bolted through and became lost; someone looking for a dog – either for their own enjoyment or as a bait dog for the numerous dog-fighting operations in that area – helped themselves. For other trainers’ experiences, see: Is it really worth it to take a chance on the fallout? Not to me. Wow! For some one who writes about dogs, you don’t know allot about dog behavior or training dogs do you? This article is complete nonsense and speculation, it is your opinion period, nothing more. No facts what so ever other than your own incompetence of leaving mouse traps where your dog could get them. Your not knowledgeable enough to even own a dog……..
Pamela…you are painfully obvious in your contempt for any form of training outside of rewards or ( +R ) only. I see by your education description that you are not a qualified animal behaviorist or animal scientist, but have earned a level of education handling dogs through The Assistance Dog Institute. Well done. However, you fail to produce any counter argument to the benefits of Hidden Fences (or Invisible Fences) in your article. To give your argument any credibility you must provide some of the welfare advantages of these devices. Because you have ignored any of the welfare considerations of an electronic fence, your article simply reads like an emotive rant. I would agree that a store bought “do it yourself” kit is a welfare issue, as the punishment/consequence of the stimulation is likely delivered by an inexperienced handler who wouldn’t tailor the training for highly prey driven and/or targeting behavior. Also, if the training wasn’t performed with a focus on the correction/stimulation being delivered in a somewhat “anonymous” way, the association to the handler and the stimulation can lead to a breakdown in the cynopraxic value. Training to a fence like this relies on proper association, valuation of “choice points” and delivering the stimulation well below the dogs (TOD) or threshold of discomfort for the purpose of eliciting a low level stress product to obtain focus; Then raise the stimulation as the drive mechanisms increase resulting in a reliable choice pattern. The peanut butter incident was caused due to your negligence to remember to remove the trap. Who’s to blame for the dogs punishment? The peanut butter or yourself? Without training tools like “invisible fences”, you leave little room for dog owners to manage their pets movements. They could run out and get hit by a car; wander off and become lost, risking dehydration…or worse. Traditional fencing for containment are just obstacles that hold no behavioral value. Why not dig out or jump over? If I can, I will. There is no punitive effect for the action. Much like today’s justice system. No accountability for bad choices. Because your article was your philosophical view, and not based on the facts, again…your article loses all credibility. You lost a reader today, and maybe more collateral damage will follow. Perhaps a “punitive effect” will surface from your painfully biased and ill-informed blog. However, I have done extensive research on the long- and short-term of effects of punishment, and I do not believe that the benefits outweigh the considerable risks. I have seen too many dogs who were traumatized by exposure to “electronic correction” to advocate the use of anything that attempts to teach by delivering an electric shock. Responsible, caring dog owners can, without use of shock, teach their dogs to stay on their property and will also be outdoors with them. Irresponsible dog owners seek quick solutions and are more likely to leave dogs outdoors unattended. It is these owners who are less likely (in my considerable training experience) to follow through with the training needed to create the “proper association” you describe.